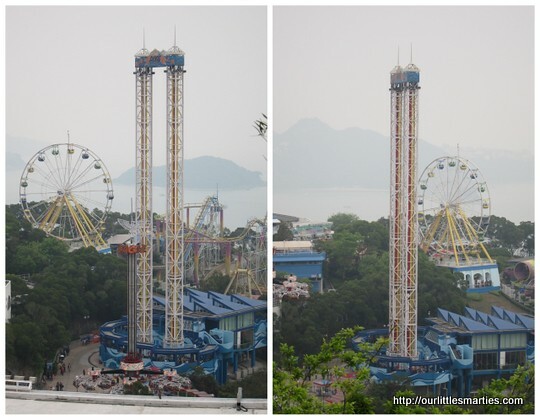 Okay, this will be my very last blog post about our recent HK trip. And it’s gonna be a long one too. Hee! It’s Day 4 of our trip. 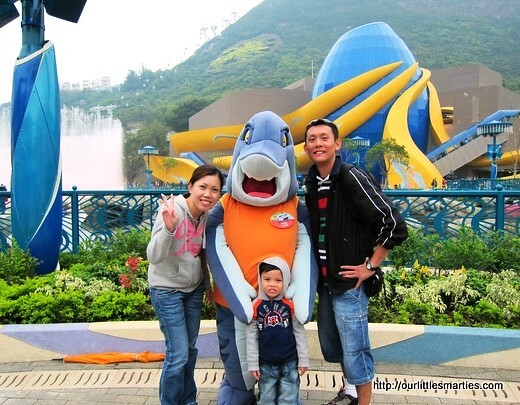 We planned to visit the famous Ocean Park before we returned to Singapore the next week. The weather was not too promising in the morning – light rain, moderately windy and the temperature dropped to about 12 deg C. It was quite cold. 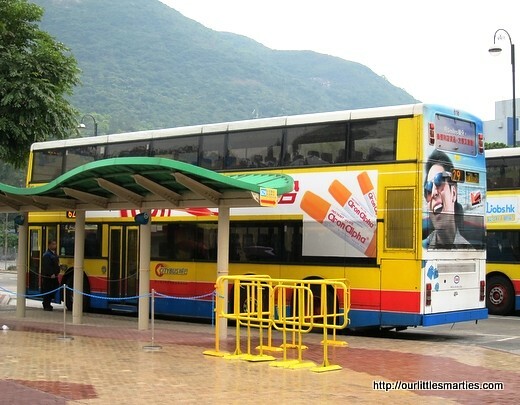 To get to Ocean Park, we took the train from Disneyland Resort Line to Admiralty MTR and changed to Citybus 629. It’s about 20 minutes bus ride. 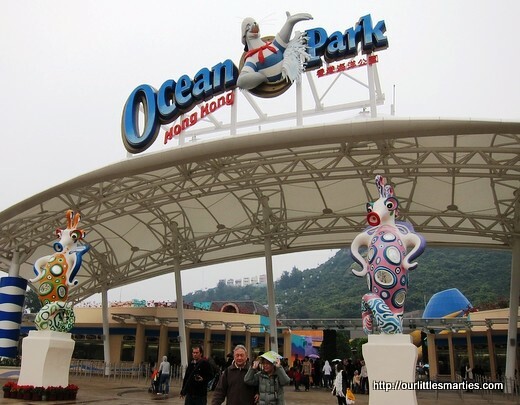 As an introduction, Ocean Park is a sea life and animal theme park offering more than 30 attractions including shows, exhibits and thrill rides for all ages. 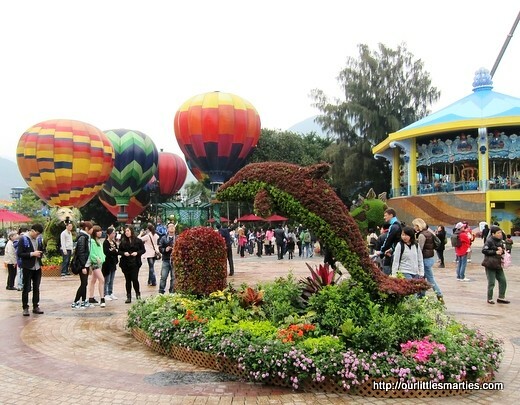 Prior to my visit, I had an impression that this theme park is rather small and old but I was completely wrong. 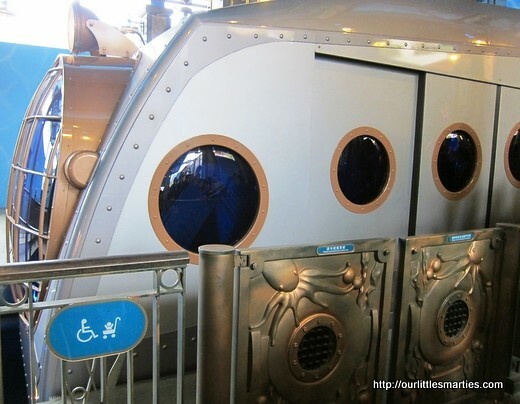 It’s even more exciting that the Hong Kong Disneyland. The visitors were overwhelming too! 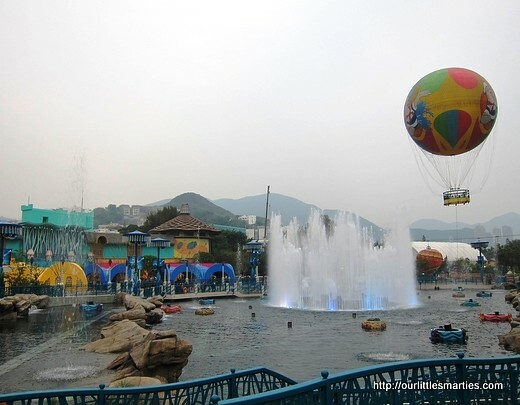 Ocean Park is indeed a nice day out for families. It’s small enough to enjoy in a day without feeling rushed but big enough that you don’t feel getting stuck repeating the same rides. It’s a little of many good things to see and experience here. 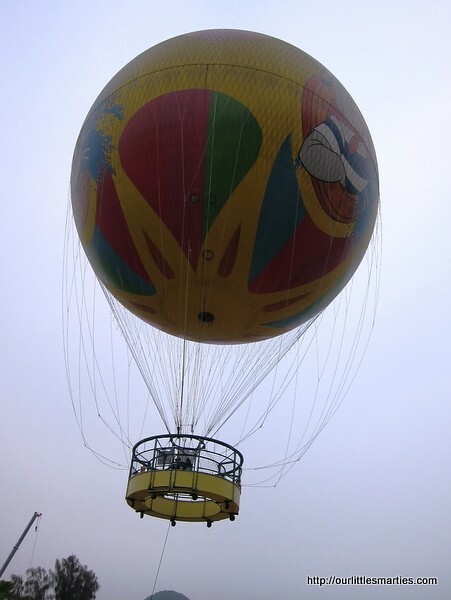 Giant Helium Balloon – Marvel at the breathtaking view of the southern side of Hong Kong when soaring 100 metres into the air in this giant helium balloon. Little Edison loves it! Cable Cars – The cable cars take visitors on a very pleasant ten minutes ride from the Waterfront to the Summit. Each car seats about five people. The views over the South China Sea are absolutely breathtaking but the waiting time was super long! Ocean Express – This is another alternative to travel from the Waterfront to the Summit. Perfect for impatient visitor who doesn’t like to wait (just like me!). This train is designed to resemble a submersible vehicle and it travels between the park’s two main lands in just 4 minutes! Visitors with children and strollers are given priority to board at the front of the train. 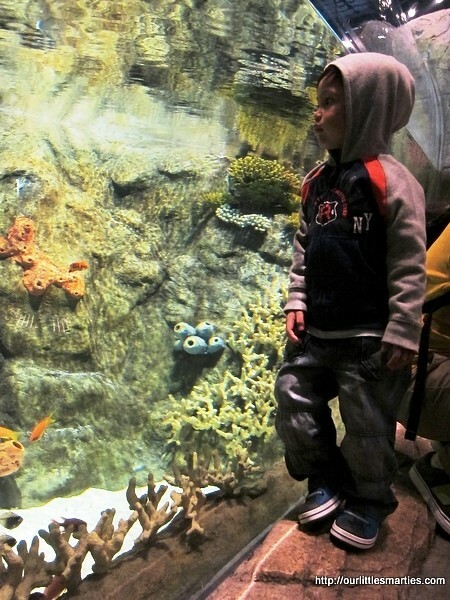 The Grand Aquarium – Similar to our UnderWater World, visitors can experience the darkest depth of the ocean floor here. At the touch pool, children get hands-on experience with sea cucumbers, star fishes and other small fishes. For the adults, there is an inspiring 13m wide acrylic viewing panel where we can see 5,000+ fishes from over 400 species. 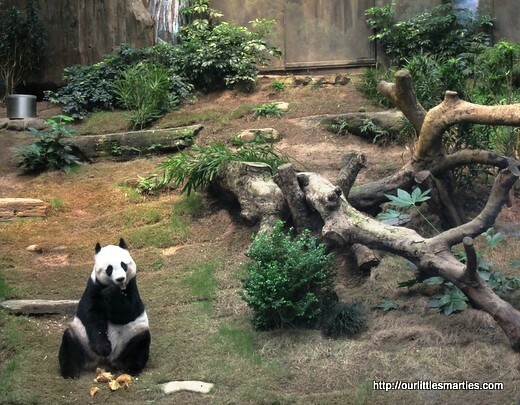 The Giant Panda Habitat – Visitors can meet two precious giant pandas here. They are named An An and Jia Jia. As you might be aware, they were given to Hong Kong in 1997 to mark the return of Hong Kong to Chinese sovereignty. This is Jia Jia. Little Edison was so excited to see her and he asked me repeatedly, “Why is she alone here? Nobody takes care of her. So poor thing!”. There is a souvenir shop at the exit of the Giant Panda Habitat. 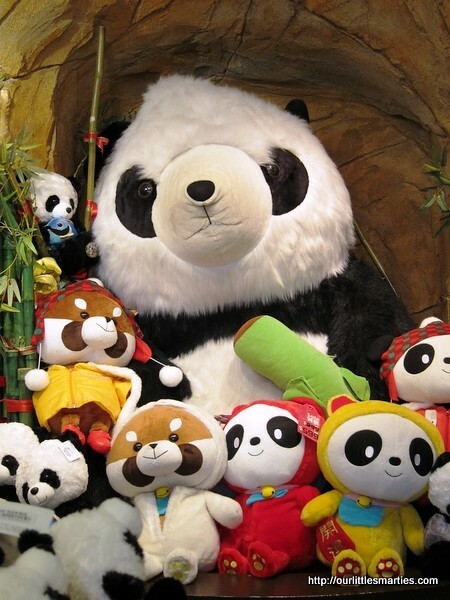 Look at those super cute panda bear soft toys! 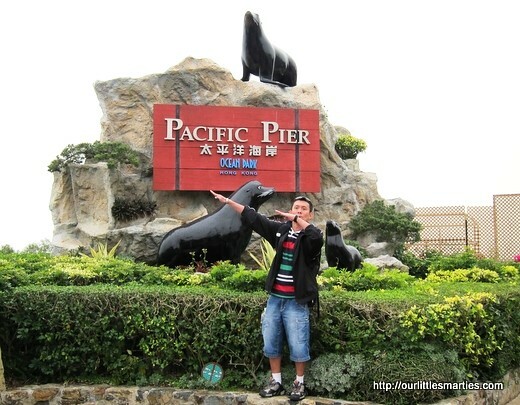 Pacific Pier – Visitors can view the rocky coastal habitat of seals and sea lions here. They frolic, sunbathe and hunt beneath the waves! Visitors may even get a chance to feed them during the feeding sessions. 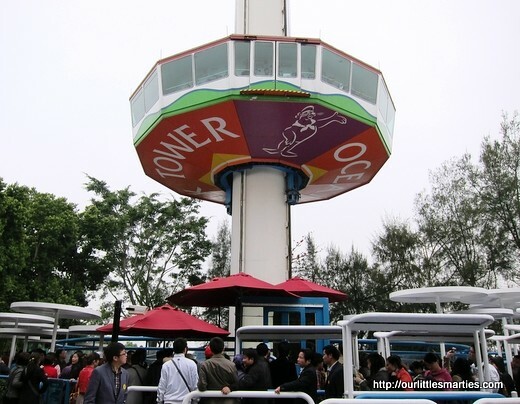 Ocean Park Tower – Soar 72 metres into the air from atop Ocean Park Tower! It is ranked as one of the tallest observation towers in Southeast Asia where guests are able to see clear to Aberdeen and the outlying islands in a gentle 360 degree rotating view. We didn’t get a chance to go up as the queue was super duper long. 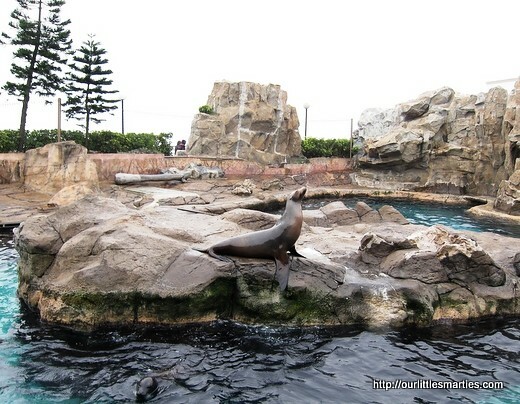 Here are some random pictures taken at Ocean Park. All in all, the theme park is beautiful and well-maintained, the rides are great, the animal shows are well performed and co-ordinated. Prices of the souvenirs are very reasonable too (way cheaper than the Disneyland!). It’s also a great getaway from the craziness of the city. A totally different experience from the Hong Kong Disneyland, I would say. That’s too bad. But even if it’s available, the queue was quite long too and waiting time was almost half an hour. I hope you enjoyed your trip to Ocean Park. It was fabulous! hi, first time here:). 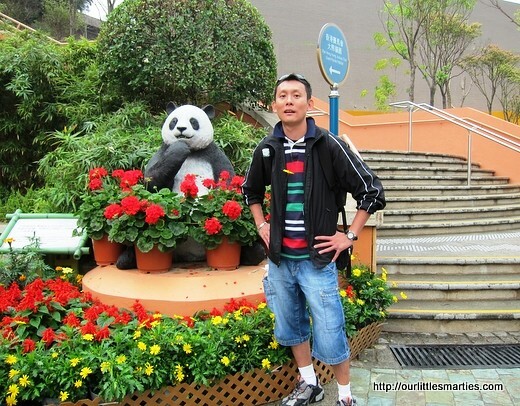 attracted to read on on your sharing about HK trip as we will be going there end May. i needed a guide badly but time ain’t allow me, sigh… mind i ask how long was your trip and despite lantau island, ocean park, disneyland and the peak, any other recommendation on must-go places? thanks! p/s: nice blog! and admire on your management among, work, family and blogging! gotto learn more from you:). We went for 5 days. Besides the tourist attractions, we went shopping at Causeway Bay and Tsim Sha Shui. There are two places that we didn’t make it due to short of time. That’s the Avenue of Stars and Wong Tai Sin temple. Great post! 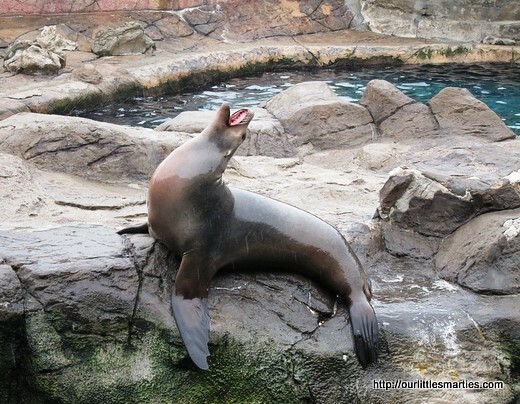 We really think Ocean Park is still worth a visit and have written a post about it. Do check it out yah?